Located nine miles from downtown Phoenix is the blustering community known as Glendale, Arizona. Prior to being known as the home of the 2008 and 2015 Super Bowl games, Glendale wasn’t much but a desert wasteland. In 1885 a man named William John Murphy, originally from New York was in charge of constructing the 40-mile long Arizona Canal. The completion of the canal brought water to the desert and made Glendale more attractive to farmers and developers. Murphy was also responsible for the development of Grand Avenue, which he built to make it easier to get from Phoenix to Glendale. Today with a population of just under 227,000 residents, Glendale is the hub for the nightlife in the West Valley, plus the credit of “Arizona’s Antique Capital,” according to the Sunset Magazine and a 1998 article in USA Today. Downtown Glendale off Grand and Glendale Avenues is where you will find a charming historic district with antiques galore, local dining and the Cerreta Candy Factory. The west side’s hotspot for all things entertainment is Glendale’s premium Westgate Entertainment District. Here you can shop for designer brands, dine on fine foods, bar hop, take in a show or catch a sporting event. Westgate Entertainment District is home to the University of Phoenix Stadium where the 2008 Super Bowl contenders, the Arizona Cardinals play football. If you love the sun but miss the winter sports, you will love attending an Arizona Coyote’s hockey game at Gila River Arena. The Gila River Arena also hosts concerts and a variety of other events throughout the year. To learn more about upcoming events, click here. Just up the 101 Loop in the heart of Arrowhead Ranch is another shopping destination in Glendale, Arizona. On West Bell Road you will find every type of restaurant, from every cuisine from across the globe. Arrowhead Mall has shopping like Express, Macy’s, Victoria’s Secret, and Tillys to name a few. For over twenty years, thousands of residents and visitors flock to downtown Glendale, Arizona to attend the award-winning “Glendale Glitters” event. From Thanksgiving Day through New Year’s Murphy Park is transformed into a winter wonderland with about 1.5 million twinkling holiday lights that decorate the landscape. The event includes horse-drawn carriage rides, visit with Santa, food, local artisans and live entertainment. If you are new to Glendale, Arizona or planning to visit during the holidays, “Glendale Glitters” is a must-see! While it’s true the entertainment and nightlife are among the best in Arizona, Glendale also has some pretty amazing outdoor activities and recreation. With weather conditions perfect for year-round hiking, there are several trails that range from easy to difficult in Glendale, including Thunderbird Conservation Park, Skunk Creek Park and Thunderbird Paseo Park. Click here to learn more about the parks and recreation trails in Glendale, Arizona. Arizona is known for the awesome weather and for baseball spring training. Camelback Ranch in Glendale, Arizona is the spring training facility for the Los Angeles Dodgers and the Chicago White Sox. Camelback Ranch is a beautiful facility where guests can bask in the sun with a lawn-seating or stay cool in a stadium seat while enjoying a spring training game. When the summer temps start to sore, residents and visitors can cool off at the Wet-n-Wild water park, also located in Glendale. If your outdoor requirements include the greens of a golf course instead of a baseball field, Glendale has plenty of choices for both public and private golf clubs. The Legends at Arrowhead is a public 72 par course designed by Arnold Palmer. Within a short drive you will find all the country club comforts at Arrowhead Country Club. Another course designed by Arnold Palmer, this is a private country club with an 18 hole course, tennis program, workout facility and a recently remodeled clubhouse with casual and upscale dining. Deer Valley Unified School District (DVUSD) has thirty-eight schools within the district and serves 34,000 Glendale students. DVUSD is proud to be an “A” rated school, with students earning scores of 3 or more on AP exams. 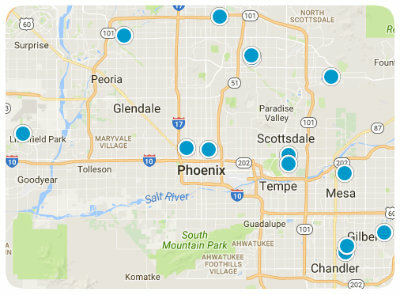 Glendale, Arizona is home to a few noteworthy schools, beyond grade schooling including Glendale’s own Community College. MidWestern University is a 143-acre campus in Glendale with state-of-the-art classrooms, labs and lecture halls, where students can study the health profession. Also in Glendale is a west campus of Arizona State University (ASU) and the highly acclaimed Thunderbird School of Global Management, where thousands of students, from across the world attend graduate degree programs. If you are thinking about buying or selling a home, give us a call at (623) 444-2983 or send us an email to explore your options and to find out when is the best time for you to make a move.